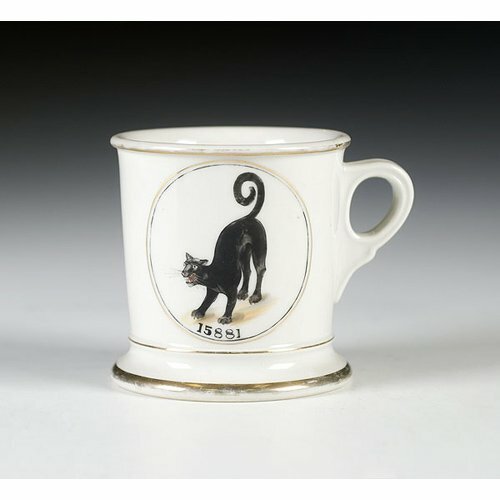 Concatenated Order of Hoo-Hoo Fraternal Shaving Mug, porcelain with polychrome painted Egyptian cat, whose tail is curled into the number 9, this being an all important number in the Order of the Hoo-Hoos, whose beliefs are grounded in the fighting of superstition and conventionalism. The Hoo-Hoos were founded in 1892 in Arkansas, and were a selective and small order, although nationally based. All of their functions, initiation fees and meeting dates were based around the number 9. 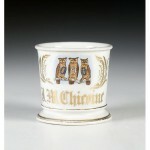 This mug is marked Limoges, France.